King Aragorn was fascinated. One of his emissaries had just returned from a land far, far away, where they celebrated a festival which commemorated a group arriving to a new world and being welcomed by the indigenous people who offered them food and grain. To show their gratitude, the explorers promptly conquered the indigenous people, crowded them into reservations, and reciprocated their generosity by giving them all kinds of diseases for which the indigenous people had no immune response, along with almost exclusive rights to gambling establishments. Who couldn’t resist making a holiday out of this? King Aragorn marshaled his army…of caterers and executive assistants. Two weeks later, the king entered his great hall and a smile crossed his face. His beautiful wife, Arwen, sat at one end of the table, with three handsome longhaired, blond elves with narrow, distinct features, and jeweled headbands, sitting erect and aloof to her right (family was a big part of this festival, Aragorn had been told), and three thick-shouldered dwarves to her left. The dwarves were already drinking, though the food had not been touched. He would forgive them their transgression. It was Thanksgiving after all. Next to his end of the table sat four, diminutive hobbits, small creatures who, Aragorn knew, had big hearts. Just seeing them made him…well, thankful. Hey, he was really getting the hang of this festival! On the other side sat Gandalf, his huge mane of hair as white as his flowing robes, his long-stemmed pipe in his mouth, though recent city ordinances meant he could no longer smoke indoors. Aragorn frowned. 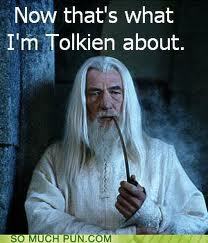 Gandalf had asked to bring a friend, but really, Gollum? All rose when they saw the King of Middle Earth enter and he magnanimously beckoned them to sit. A huge cheer went up from the hired, union card-carrying and adoring crowd, packed into the corner and given generous barrels of beer and non-alcoholic refined sugar (for the designated cart drivers) – another discovery from the land of Thanksgiving. “Is there a gluten-free option?” Elrond asked, sending just the right message of disdain at the idea of meat. “Avocado,” Queen Arwen snapped, wondering why one was expected to invite relatives to this new festival. “I use that on my skin,” Legolas said, “as you can all see.” As one, they all glared at him. “Oops,” said a dwarf, his mouth full. “Bloody dwarves,” a voice said and intended only for pointed ears. “Excuse me?” An axe was quickly brandished. The axe came down hard and everyone spend the next ten minutes, wiping the fat and grease from their hair, beards, and fine garments. At least, this festival will please the dry cleaners, the queen thought. “I am sitting down!” Gimli shot back. He glanced over at the hired cheerers, who raised their glasses and cheered. “How about you, Gimli?” the king asked quickly as the dwarf glared across the table. And off the dwarves went with their favorite song: “Gold, Gold, Gold.” But they soon got confused with the lyrics. “Thank goodness,” she mumbled into her napkin. Aragorn indulged him and they both tugged. There was a pop and a flash. Then a single shimmering gold piece flew into the air and Gollum deftly caught it. He put it on and promptly disappeared. King Aragorn was fascinated. One of his emissaries had just returned from a land far, far away, where they celebrated a festival which commemorated a group arriving to a new world and being welcomed by the indigenous people who offered them food and grain. To show their gratitude, the explorers promptly conquered the indigenous people, crowded them into reservations, and reciprocated their generosity by giving them all kinds of diseases for which the indigenous people had no immune response, along with almost sole rights to gambling establishment. “Avocado,” Queen Arwen snapped, wondering why you were expected to invite relatives to this new festival. Alon Shalev is the author of the 2013 Eric Hoffer YA Book Award winner, At The Walls of Galbrieth, The First Decree, Ashbar – Wycaan Master Book 3, and Sacrificial Flame (Wycaan Master Book 4) all released by Tourmaline Books. Shalev is also the author of three social justice-themed novels including Unwanted Heroes. He swears there is a connection. More at http://www.alonshalev.com and on Twitter (@elfwriter).